I have a cardigan that's unmistakably ugly; the colour is drab and makes me look like I'm either coming down with a cold or getting over one. It was made for a tall man, which I am not, so the shoulders droop. On the left side, at my hip, above the pocket, there's a small hole, round and neat like you pushed a sharpened pencil through the wool. I've rolled the cuffs so many times that they're stretched out, and are beginning to ruffle at the edge. Still, the sweater is in my closet, because it is warm and comfy, and I like it. No matter its looks. I feel very much the same way about panade. I'm a sucker for substance. A panade is like a savoury bread pudding, or the best parts of French onion soup and a gratin packed together in a casserole. 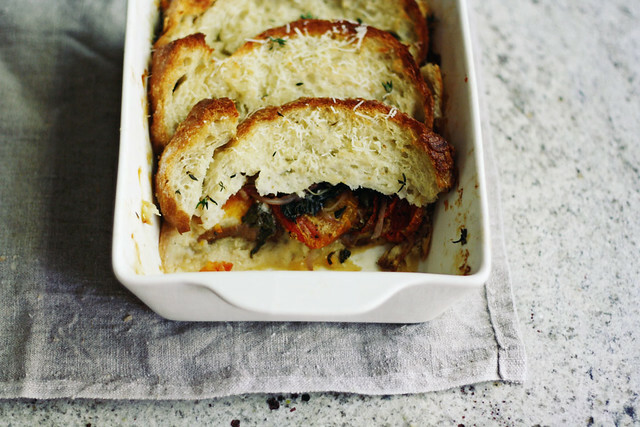 There's bread and cheese and vegetables stacked up on top of each other, baked until the bottom goes lush and the top is crusted golden. A collection of humble ingredients — a fine use of those past their prime, actually — and one that lands up at an end far more auspicious then its start. It's made with stock rather than a custard to bind the layers, so even though rich and filling, the flavour of is clearer. There's acidity from the wine and tomatoes, the sharpness of sturdy greens, the pronounced, aromatic nuttiness of Gruyère; all together, yet each on their own. 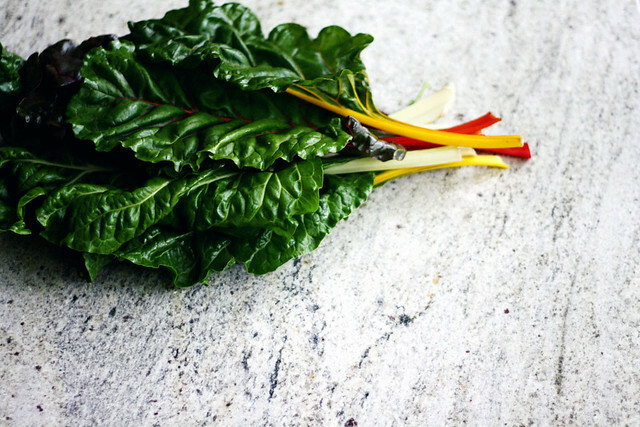 You may be familiar with the recipe for chard and onion panade from the Zuni Café cookbook; if not, you'll find it has a deservedly faithful following. This version adds tomatoes, and their inclusion made it perfect for our start to October, as the trees are starting their turn to technicolour but the days are warm enough that there are (crazy) folks wearing shorts and no coats. This panade is what we had one night when, if not for dinner, I was ready for the blanket we keep tucked by the couch. Hot and bubbling from the oven, we spooned our meal sloppily onto plates — though the crust shattered with an impressive shower of crumbs, underneath there were puddles of broth, and the oozing slip of melted cheese. The vegetables were supple but retained a messy integrity, if not their colour. We had fried eggs on top. 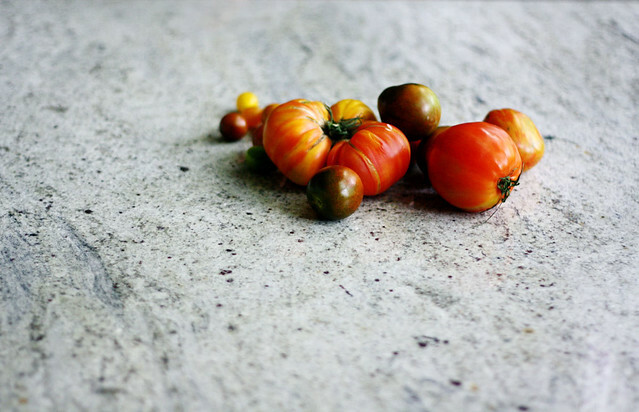 It seems a counterintuitive to take vibrant tomatoes, minutes away from the end of their season, pile them with bouncily green bunches of rainbow chard and lacinato kale, and cook the lot of it to a muted sog, and yet, it makes absolute sense. The result is pretty much exactly what's going on outside right now, a season that blazes but feels cozy; one that's equal parts shining sky and colours turned up to eleven, as it is grey clouds and dim evenings, with the lights turned on early. Floppy sweaters and panades, both fit me fine. Adapted from Food and Wine. With two children at the table, I didn't let the panade bake too long uncovered, since when the crust goes terminally crunchy it can be difficult for small mouths to manage. If that's not a concern, feel free to fully blitz the top until crispy all over. Butter a 10x15-inch baking dish and set aside. Preheat an oven to 400°F (200°C), with a rack in the upper third. In a large, wide pot of boiling water, cook the greens for 2 minutes, then drain into a colander and run under cold water. Once cool enough to handle, squeeze out the excess water. Chop coarsely and set aside. In the same pot, melt 2 tablespoons butter with the olive oil over medium-low heat. Add the onions and thyme and cook, stirring occasionally until the onions have softened, around 12 minutes. Stir in the garlic and cook for 2 minutes more. Raise the head to medium-high and pour in the wine; simmer until the wine has reduced to 1/4 cup, around 5 minutes. Stir in the greens and season with salt and pepper. In a small saucepan, bring the stock to a simmer. Line the bottom of the prepared baking dish with one-third of the bread slices, overlapping and trimming the bread to fit. Layer half the tomatoes on top, and season with salt and pepper. Spread half the greens mixture on next, then half of the cheese. Repeat layers with the remaining ingredients, gently pressing down as you build, ending with the bread. Carefully pour the stock over the casserole and press down again, this time using a spatula. Melt the remaining 2 tablespoons of butter and brush over all. Cover the dish with foil and bake in the preheated oven for 1 hour. Remove the foil and bake for 10-15 minutes more, until the top is browned and crisp. Remove from the oven and allow the casserole to rest for 10 minutes before serving. At the table, sprinkle some reserved cheese on top, if desired. Serves 8, nicely with a salad and/or a fried egg alongside. I used a mix of tomatoes we had hanging about; if you don't have beefsteaks, semi-roasted Romas would be particularly fine, as done here. Fontina is a good switch for the Gruyère. 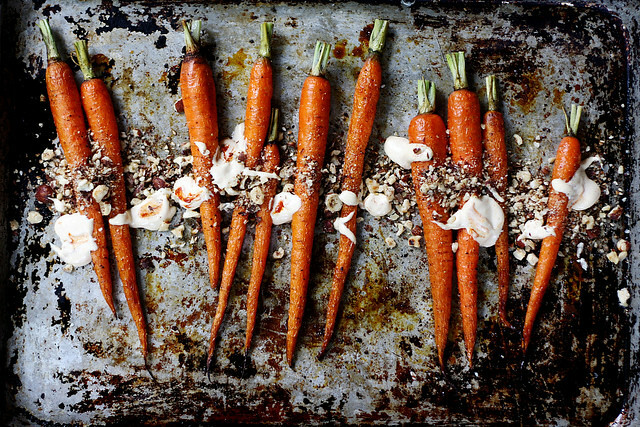 From UPPERCASE magazine, issue #15: cooking science and a recipe for roasted carrots with rough dukkah, and one for harissa mayonnaise. Entries will be accepted until at 11:59 p.m. on Friday, October 12, 2012. My continued thanks and best of luck! xo. At 10:54 or so on Wednesday night, I started thinking about crackers. The thought was so engrossing, the interest so strong, that it took no more than three seconds after the notion entered my mind for me to say to the friend with whom I was chatting "I would really like some crackers." I am a riveting conversationalist. There were no crackers in the pantry, so to satisfy my desire would mean productivity on my part. Good sense and laziness thankfully won the day, and I managed to leave the kitchen neat and tidy that night. In a stunning display of restraint, I held off until the morning. And thus, at 7:15 a.m. on Thursday a bowl of dough, dusted in flour and proofing quietly, rising and puffing proudly, resided on our counter. 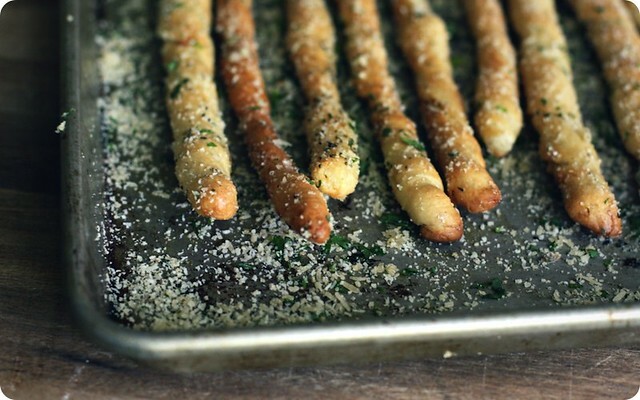 By noon, there would be Garlic Herb Bread Twists. Please don't look at me like a crazy person, I know full well that a stick of bread may not be a cracker, per se, but they met our requirements with ease. I wasn't aiming for a crackers-and-cheese cracker, not a shingle demoted to the role of vehicle for something else. I wanted salt, crunch, a snack on its own that required no further accessory. All they take is pizza dough, bought or homemade, laminated with parmesan, rosemary and thyme, salt and pepper. Cut and twirled into curling lengths, they receive a brush of garlic oil before they're into the oven. A second anointing as they come out of the heat, in my version the oil is cut with honey, and then a toss through a mix of Parmesan and parsley. Thoroughly coated, utterly habit-forming, they're good to go. I like the ones with some relative heft - their crust has a pleasing substance, and through the middle the crumb is spongy and dense for a satisfying chew. However, Sean prefers those stretched thin and allowed to crisp, so their crunch is not only at the edge but remains right on though. The one for him are the ones down below, gnarled and uneven, thoroughly golden and pleasurably snappy. Eight hours is what it took from impulse to the making of these cracker-ish sticks, three hours from start to munching, and less than an afternoon for them to be gone. A pretty neat little timeline I'd say. In the name of efficiency, however, I think next time I won't bother waiting and set about making them right the very minute the craving strikes. And strike it will, to be sure. Patience may be a virtue, but snacks are a necessity. From Gourmet Magazine, July 2009. Since I have made changes to the ingredients and method, I've rewritten the recipe for ease. To bring further depth to the garlic oil, the garlic is steeped in warm oil to rid it of any harsh bite. I've also added a pour of honey, to round out and soften the piquancy of the cheese and garlic. Preheat oven to 400°F (200°C), with racks in the upper and lower thirds. Line two baking sheets with parchment paper, and set aside. In a small bowl, stir together rosemary, thyme, 1/4 cup cheese, 1/2 teaspoon salt and 1/4 teaspoon pepper. In a small saucepan, stir together the olive oil and garlic. Place the pan over medium heat, and warm gently until the garlic starts to become fragrant. Do not cook the garlic or let it sizzle. Remove from the heat, stir in 1/4 teaspoon salt and 1/4 teaspoon pepper and set aside to cool. Divide the dough in half, covering one portion with a tea towel (not terry cloth). On a lightly-floured work surface and with a floured pin, roll out second portion to a rough rectangle measuring 15- by 10-inches. Sprinkle half the herb mixture over the lower (crosswise) half of the dough. Fold the dough towards you, bringing the two top corners to the bottom, sealing in the herbs. Roll gently to bring the envelope of dough to a 10- by 8-inch rectangle. Using a knife or pizza wheel, cut the dough lengthways into 9 strips, each less than 1-inch in width. Twist each strip, turning from both ends, and place on one of the prepared baking sheets, each strip about 1 inch apart. Brush the strips with garlic oil, using 1 tablespoon divided amongst the 9. Set aside. Repeat process, rolling out the reserved dough, sprinkling with the remaining herbs and cheese mixture, rolling again, cutting and shaping. Arrange these strips on the other baking sheet, and brush them with 1 tablespoon of oil divided between them. Set aside for 5 minutes. Bake the twists in the preheated oven, rotating pans and switching positions halfway through, until golden brown and crisp. This should take between 20-25 minutes. While the breadsticks bake, stir the honey into the remaining garlic oil. Sprinkle the remaining 3/4 cup cheese on a shallow baking pan along with the parsley. 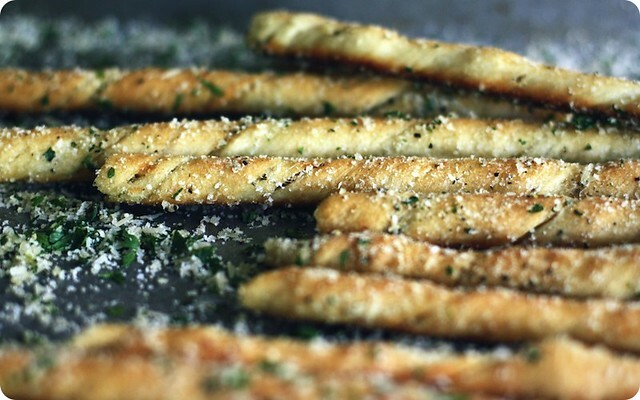 When the breadsticks are done and still hot, brush lightly with the oil and honey. Immediately roll them in the cheese and parsley, until well coated. Serve warm or at room temperature. The days of these weeks have washed over us like waves; we've been carried on their highs and lows, along their ebb and flow. We've followed the constant movement of the current, and kept our heads above water. Buoyed by a raft of bread, no doubt. That last bit was probably only funny to members of my family, as in the midst of all of this, my island refuge has been the kitchen and my conveyance out of the deep has been bread. Lots of bread. Oh, the bread there's been. Breads both sweet and savoury. Bread to eat, to share, to pack up and send out into the world. To pick the candidate for our bread-boating excursion, I'd would most certainly choose the Pane Integrale from Jim Lahey. It is a bread flour and whole wheat incarnation of his famed No-Knead Method, a recipe I'm sure familiar to many of you, but I'll offer a refresher just in case. Most often, baking bread sets the pace for our hours; it is in the time between the kneading and the shaping and the baking, that the rest the day takes place. There is a schedule to be kept and yeasted breads often benefit from your rapt attention. They are enlivened by your efforts, requiring your labour to turn boggy dough into a sprightly loaf. But this bread, however, is another sort of bread. 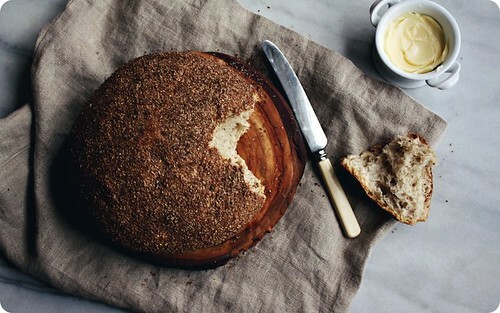 It is a bread that asks for very little of its maker, only a warm spot to reside for a day. There's a quiet companionship of that bowl upon the counter, its presence made ever the more gratifying when that bowl is a glass one and you can observe the metamorphosis of flour, water and yeast inside. For in that day, a slump of dough transforms itself into a billowing sponge that's double the size of what it was to begin. After that, a quick shaping and another rest. A few more hours now, while a cast-iron pot (with lid) preheats in a blistering oven. Dough goes in, lid goes on. And then, while unobserved, is when magic to this trick becomes evident; the dough goes swelled and bronzed, gently arched on its top and deliciously-scorched underneath. When the lid is lifted, you're met with steam touched with smoke and the heady scent of baking bread. Like I said, magic. Out of the pot and on the counter the bread snaps, crackles and pops as it cools. Lahey calls this auditory phenomena of exterior and interior settling as singing, and I'm pretty fond of that thought. When the tune finally ends, you are left with a bread with a chewy crust and a crumb full of pockets to hold lots of butter. Or to dunk into soup. Or to smear with chèvre and honey. As a meal upon the water or the raft upon which you float, and through calm or choppy seas, some good bread is often just what you need. Smooth sailing to you, friends. I'd forgotten until now, that they boys have a book where in the pivotal scene, the characters set out for a new world on sailboats made from sandwiches. Thanks for the inspiration, Ms. Barrett. A no knead crusty boule using whole wheat flour, from Jim Lahey's book My Bread. It happens that I'm also talking about bread, soft and squishy sandwich bread in particular, in the latest issue of UPPERCASE magazine. You can find it here, if you'd like. 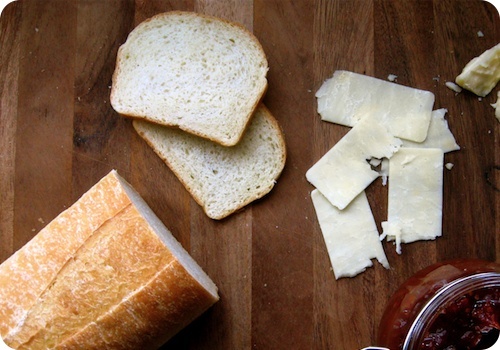 Honey-hued and tender, Soft American-style Sandwich Bread, from the book Artisan Bread in Five Minutes a Day. It started with chocolate cake, then it was peanut butter cookies. Now, it's sandwich bread. You see, I'm not one to leave well enough alone. I have fidgety digits, hands that almost twitch at the prospect of fiddling with an idea. An idea will capture my attention, and I find it nearly impossible to let go; even if I attempt to shove it aside to deal with the matter at hand, the idea it will remain, incessantly tugging at the edge of my attention. Lest I begin a nervous tick, or start yelling at my own brain, I invariably give in to my impulses. After asking for direction on soft sandwich bread recipes to try, I was offered a myriad of helpful suggestions. Wonderful help, and to be sure there was no way I was going to let the guidance go to waste. So I began baking, first Julia Child's Classic White Bread from Baking with Julia (William Morrow Cookbooks, 1996), then the Soft American-style Sandwich Bread (pictured above) from the fantastic Artisan Bread in Five Minutes a Day (Thomas Dunne Books, 2007). Both were delicious, each in their own way (more on that in a moment). 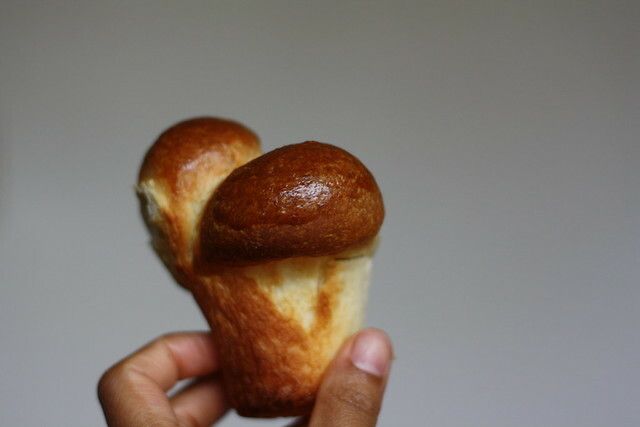 What these breads solidified for me was my criticism of Ina Garten's Honey White Bread; too sweet and too eggy. I simply do not like eggs in my sandwich loaves. I like eggs in some breads, Egg Breads to be specific, but those breads I consider a whole other food entirely. In my standby everyday sandwich breads, I want something milder, subtle but with flavour, appropriate for both savoury and sweet uses and without too much richness. Egged breads have their own place, but in my mind that place is not alongside tuna fish at lunchtime. Your mileage may vary. Back to the recipes I did like. 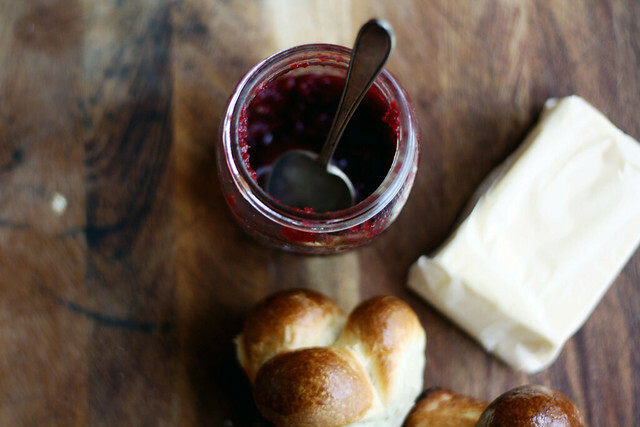 The Soft American-style Sandwich Bread from Jeff Hertzberg and Zoe Francois, authors of Artisan Bread in Five Minutes a Day. With a more modest amount of yeast than some other recipes I have seen, and a longer resting time, this bread had a remarkably deep flavour. The inclusion of melted butter resulted in a crumb that was substantial yet light, yielding but still hearty enough to be sliced cleanly and well-suited as the base for even Dagwood-esque creations. The recipe yields three loaves, I sent some dough home with an especially-cherished friend, and she found it exactly the sort of bread she likes. My heart, however, was not wholly won over. The aforementioned butter was delicious, but almost too much of a good thing (perish the thought). While I have never been one to shy away from full fat in all its glory, the quantity of fat was again a distraction. It became about the butter, and not about the bread as a whole. The other strike against this loaf was that I'd made Julia Child's Classic White Bread earlier in the week and I was already rather smitten. I should have known America's grand-dame of gastronomy would have the (almost) perfect recipe. The dough was gorgeous to work with, laminated with less softened butter than the Soft American-style, and sublimely silky. 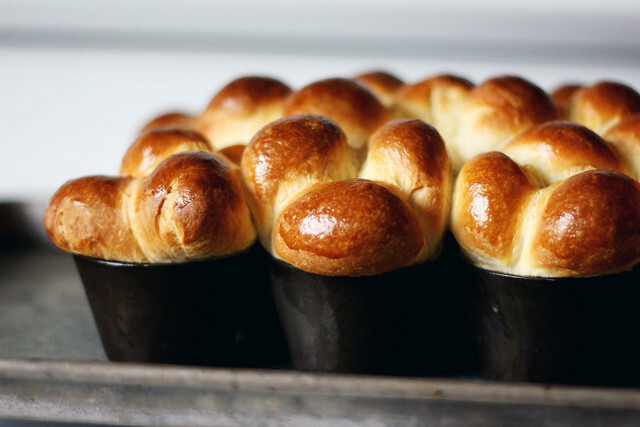 The loaves rose to impressive heights when baked, cresting well over the edge of the pan and sporting a burnished-gold tan. Their texture was spot-on; soft and tender, and slightly springy to the tongue. Most probably attributed to the thorough kneading the dough requires, it was this texture that made this loaf truly exceptional. But even as I was deeply mired in a blissful state of carbohydrate-induced languor, I had a nagging impulse. An annoying little idea of how I could take this great recipe and (possibly, hopefully) make it better. After years of eating breads with minimal leaveners and slow rises, I have come to prefer their flavour to that of quicker-risen loaves. Even in my flour-dusted stupor of bready goodness, I could not get past the fact that I could taste the yeast in Child's bread. As such, while I favoued the overall results from her recipe, I still found the longer-rested breads from Hertzberg and Francois, and Jeffrey Alford and Naomi Duigud (HomeBaking, Random House Canada, 2003) appealing. Simply put, they had an understated complexity that is lacking in heavily-yeasted breads. So what to do? Well, although I am no expert on the matter, I am going to attempt an experiment. I am going to combine the elements of all three recipes, to see if I can manage to capture the best traits of each. Possibly this will end in utter disaster, possibly in delicious bread. I'll be sure to share the results. Oh, and did I mention that I have found the excuse to bake two chocolate cakes for Benjamin's upcoming birthday, just so I can try out another side-by-side comparison? Neurotic behaviour? Yes. Delicious dividends? Oh yes, very. So how can I complain about that?